Bowness on Windermere is the port which serves Windermere Lake. Windermere is 10 miles long and up to one mile wide, making it the largest lake in Cumbria. The best views of the lake can be had between Bowness and Ambleside. 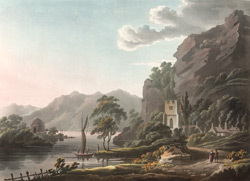 Wordsworth wrote in 1810: "Windermere ought to be seen both from its shores and from its surface. None of the other Lakes unfold so many fresh beauties to him who sails upon them. This is owing to its greater size, to the islands, and to its having two vales at the head, with their accompanying mountains of nearly equal dignity." Besides being an attraction for visitors, the lake was a source of food and transport for the communities who lived around it.